This can happen when you have long term dreams or when your business has gotten older (and so have you!) and plans and things have changed. I cut my teeth in tech as a community manager, it’s always been my dream to have a membership community. It just made sense to me. I’ve helped many businesses build their own communities, and my very first big experience online was creating a community around an old blog. For 6 years, I wanted to create a community for my business, one that I could dedicate to helping small business owners. It just seemed like the next logical thing to do. I kept thinking I’d take the plunge when the time was right. As time continued to pass, I did very little towards taking action for the community. Something that should’ve excited me and propelled me forward kept me in a holding pattern. That should have been a sign immediately. As my business has gotten older, so have I. I’ve changed and I work differently now. Yet somehow, some of my plans haven’t evolved with me. I’ve been holding on to old ideas, old dreams, and ultimately an old me. This weekend, I decided to just let go of the dream of a community. I got honest with myself: the idea of creating a community while on the whole sounded exciting as in the idea of it, but the work that would go into it was anything but. It made me immediately exhausted. Don’t get me wrong, running your business is a lot of work and can be exhausting. There are very important things you need to do that will exhaust you for sure! But the pay off is almost always worth it, and if your heart isn’t in it - pay attention to that! 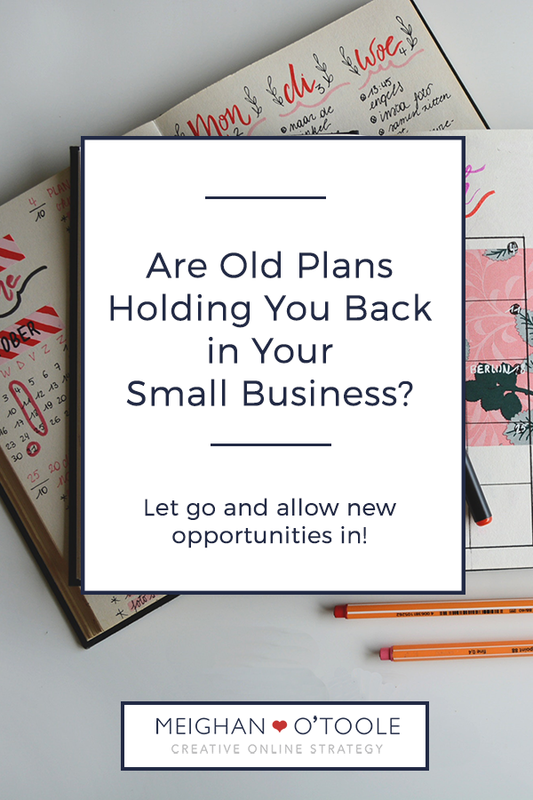 Are you holding onto old plans? Do you find yourself putting something off that you’ve been holding onto for years? For instance, do you have a grand plan (or even a smallish plan) that is on the big to-do list that you just never seem to get to? Was it something you decided you would do long ago, yet you’ve take no real action to get there? It might be time to let it go. And if it is, I invite you to wish it well and say goodbye to it. Letting it go will not only release a ton of unnoticed stress in your brain (or perhaps noticed stress), but it’ll free up a ton of energy to develop other opportunities and allow you space to welcome new goals. Sometimes it’s painful making these changes, it can feel like a loss. But if it’s not working for you, don’t allow it to take up anymore of your time. And who knows, maybe taking that time away from this dream might breathe new life into it down the road. Or maybe setting that dream free will allow the space for something even bigger and better to show up for you.